I cannot describe the adoration I have for you right at this moment. I watched as the photo fully appeared on my computer screen and my jaw dropped! Gorgeous cake! 5 university court is where I'm waiting for my piece:) YUM!!! am making a homer-esque noice currently!!! This looks divine!!! Congrats on your niece. Cake looks delish! that looks like the best chocolate cake ever. dense, moist, dark. great photo!!! Oh I'm salivating! So want a slice with a fork all my own! 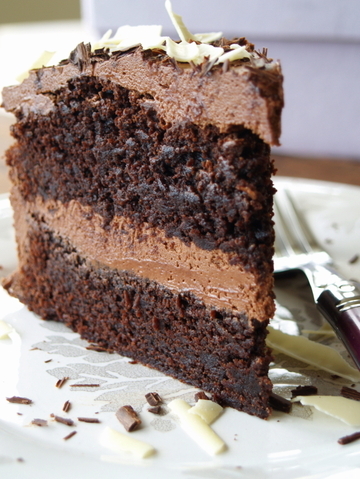 Well, those pics just created a chocolate craving that will not be satisfied with anything but that cake! Wow, it looks decadently delicious! I NEED that cake. NEED, d'you hear?! I think you need a book deal, that photography and your style of writing has Christmas best seller written all over it. You should strike while the "Ice-Cream Iron" will be hot. If Kieren's book does well it could open the door for "Eat Drink Live" the book. 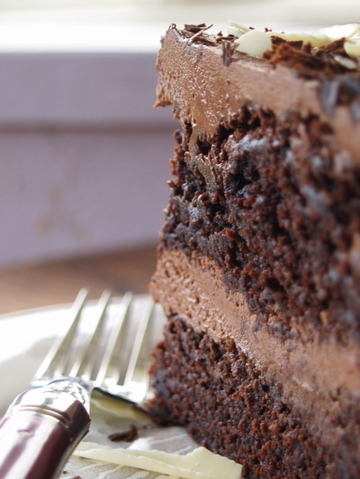 That chocolate cake looks so amazing! Yes, a book!!!!!! Can you start an online campaign for that kind of thing? I agree with what the others have said, you really should be writing a book as well as the blog :-) You have a real talent for photos & for describing the recipes. I'm so glad I've discovered your blog. PS- it goes without saying that this is a delicious looking cake. Delicious! I want a bite of that. I don't suppose you have the recipe for this using US (American) measurements. You know we as a nation, can't do math. :) But we can eat our chocolate cake. I think your blog is great , I love the comments.